At Warkworth Castle, Hotspur enters reading a letter from Richard Scroop, the Archbishop of York, that expresses wariness about the dangerousness of Hotspur and the other rebels’ treason plot. The Archbishop says he loves the Percy family and supports their cause but thinks the plot is too risky. As Hotspur reads on, he grows more and more infuriated. He first berates the Archbishop for being cowardly, then accuses him of being traitorous and works himself up into believing that the Archbishop will reveal the rebels’ plot to King Henry himself. Hotspur, impassioned, resolves to leave immediately to set the plot in motion. Hotspur, with his typical hotheadedness, has no patience for caution and understands everything in brute terms: either one is honorable and eager to fight, or one is wary of fighting and therefore dishonorable. His own black-and-white understanding of honor twists Scroop’s language from friendly advice into traitorous insult. Lady Kate Percy enters and Hotspur announces he’ll be leaving her within two hours. Lady Percy, distressed, begs Hotspur to tell her what’s wrong, for he’s been neglecting her for two weeks and has been cheerless, sleepless, and without appetite, muttering in his sleep about war. She demands to know what he’s up to and says that if he loves her, he’ll tell her. Lady Percy can tell from the appearance of Hotspur’s behavior that something is wrong, but she’s angry because he hasn’t taken the time to deliberately communicate that fact to her in words. Hotspur calls a servant to prepare his horse. He hasn’t been listening to Lady Percy at all, and she repeats her question for him: “What is it carries you away?” she asks. “Why, my horse,” Hotspur replies. Infuriated, Lady Percy threatens to break Hotspur’s finger if he doesn’t tell her the truth. Hotspur angers and says he doesn’t love her. Lady Percy, now anxious, asks if he really means that. “When I am o’horseback,” Hotspur replies, “I will swear I love thee infinitely.” He refuses to confide his plans, tells Lady Percy that she’ll be travelling soon too, and exits. Further evidence that Hotspur is a man of action with no command or sensitivity to language: he at first doesn’t hear his wife’s speech at all and then, when he does hear it, interprets her words in the shallowest possible way. He next throws around deeply hurtful language (telling his wife he doesn’t love her) as if it were nothing but an offhand comment. Ross, Margaret. 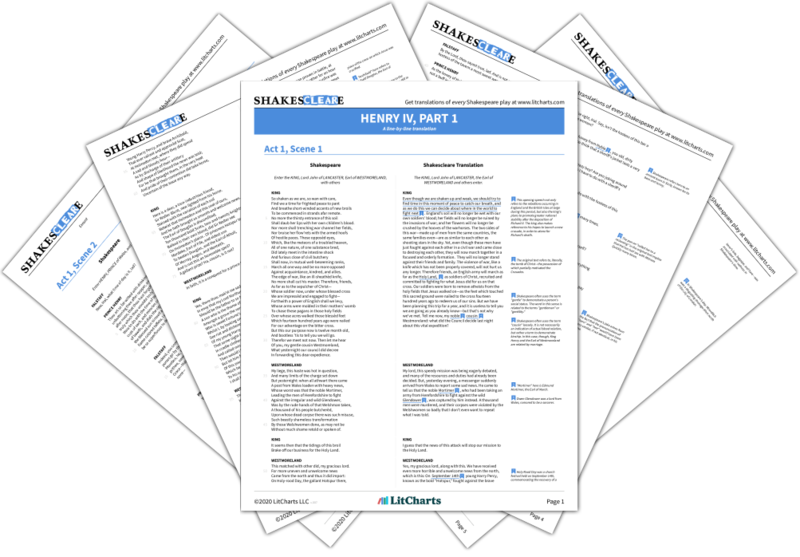 "Henry IV Part 1 Act 2, Scene 3." LitCharts. LitCharts LLC, 18 Jun 2014. Web. 25 Apr 2019. Ross, Margaret. "Henry IV Part 1 Act 2, Scene 3." LitCharts LLC, June 18, 2014. 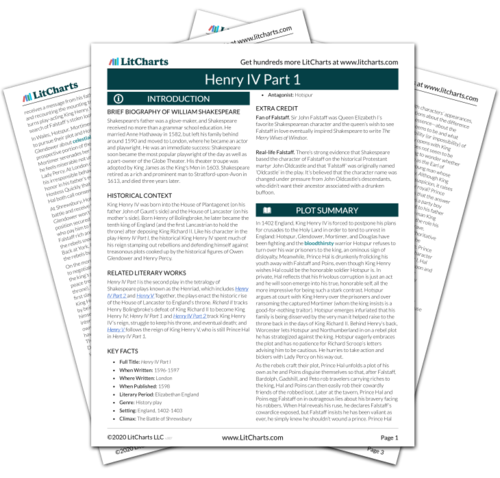 Retrieved April 25, 2019. https://www.litcharts.com/lit/henry-iv-part-1/act-2-scene-3.